A parliamentary report of 1777 recorded parish workhouses in operation at Bicton (for up to 6 inmates), Bridford (12), Clist—Hydon (14), Clist—St Lawrence (10), Colaton Rawleigh (27), Holcombe Burnell (6), Honiton (60), Kenton (150), Otterton (20), and Topsham (82). Clyst St George is 11 miles long and nearly the same broad, with about 150 inhabitants. 18 houses pay tax (one a double tenement), 28 cottages exempt. The men are wholly employed in agriculture; the women make lace and spin. Farms are generally from £50 to £200 a year; one of £400. There are no commons or waste lands; the whole parish has been enclosed many years. Tithes are compounded for at 2s. 6d. in the pound on the actual rent. Two pounds an acre seems about the average rent, but the landlord pays all Poor's Rates, taxes and repairs, computed at 5s. in the pound. Land tax about 2s. Price of provisions has greatly increased in the last two years; the Poor cannot purchase meat at less than 4½d. or 5d. the pound; wheat is 12s. per bush. Winchester measure; butter, 13d. per lb. ; common cheese, 4d. per lb. Agricultural labourers in general receive Is. a day and liquor; few farmers give 14d. a day and liquor. During corn harvest meat is added. No labourer can at present maintain himself, wife and children on his earnings. All have relief from the parish in money, or corn at a reduced price. Before the war wheaten bread and cheese, and about twice a week meat, were their usual food; now barley bread and no meat. They have of late made great use of potatoes. An industrious healthy man can earn 8s. a week by piece work on an average throughout the year. Labourers' children are often bound out apprentices at 8 years of age to the farmers. Prior to the present scarcity a labourer, if his wife was healthy, could maintain two young children on his 6s. a week and liquor without any parochial relief. A very few years ago labourers thought themselves disgraced by receiving aid from the parish, but this sense of shame is now totally extinguished. The Poor are in general maintained by weekly pensions ; some receive occasional relief. Devon: Alpington, Ashton, Ashcombe, Aylesbear, Bicton, Brampfordspeke, Broad Clist (2), Bridford, Christow, Clist Hidon, Clist St Lawrence, Colaton Rawleigh, Doddiscombsleigh, Dunchediock, Dunsford, East Budleigh (2), Exminster, Exmouth and Littleham (3), Farringdon, Heavitree (2), Holcomb Burnel, Honiton Clist, Huxham, Ide, Kenn, Kenton (2), Lympstone, Mamhead, Nether Exe, Otterton, Pinhoe, Poltimore, Powderham, Rockbeare, Rewe, Shillingford St George, Sawton, St Leonard's, St Thomas (4), St Mary Clist, St George Clist, Stoke Canon, Tedborne St Mary, Topsham (3), Upton Pine, Whimple, Whitecombe Rawleigh, Whitestone, Woodbury (2). Later Additions: Budleigh Salterton (1894), Dotton (1858), Newton Poppleford (1898). The population falling within the union at the 1831 census had been 19,490 with parishes ranging in size from Membury (population 370) to St Thomas itself (2,719). The average annual poor-rate expenditure for the period 1833-35 had been £10,218 or 10s.6d. per head of the population. 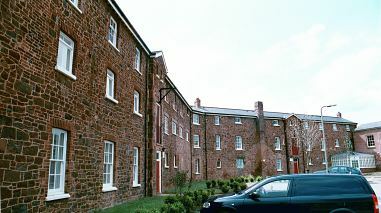 The new St Thomas workhouse was built in 1836 in Redhills, to the west of Exeter. It was designed by Sampson Kempthorne who was also the architect for other Devon workhouses at Axminster, Barnstaple, Exeter, Okehampton, South Molton, and Torrington. It accommodated 450 inmates and the total cost, including 3.5 acres of land, was about £11,000. The workhouse location and layout are shown on the 1904 map below. The workhouse layout was based on Kempthorne's standard hexagonal Y-plan design. The area between the wings of the building were divided up by walls to give a total of six exercise yards for each of the various classes of inmate. 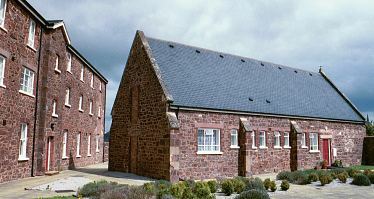 The entrance and administrative block was at the south of the workhouse. This would have contained Guardians' board room, porter's room, and offices for the Union's clerk and relieving officer. St Thomas entrance block from the south, 2001. The main accommodation wings were of three storeys and radiated from a central supervisory hub. Various single-storey utility rooms and workshops formed the hexagonal perimeter of the building. St Thomas accommodation wings from the north-east, 2001. 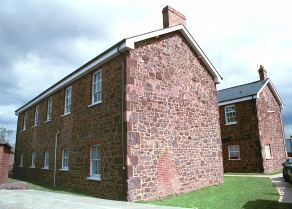 A separate hospital block was later erected to the north of the workhouse. This was erected in two stages and its two blocks were known as the Victoria Block (date unknown) and the later Albert Block dating from 1897. St Thomas hospital block from the south-east, 2001. A chapel was also erected in the north-eastern yard. St Thomas chapel from the south, 2001. In 1894, the British Medical Journal set up a "commission" to investigate conditions in provincial workhouses and their infirmaries. Following a visit to St Thomas, the commission's report was broadly favourable. The criticisms of the infirmary were mainly to do with deficiencies its structure: separate isolation wards were required, especially for venereal cases; day rooms were needed for the more convalescent patients; a separate labour ward, imbeciles' ward, and infirmary ward for children were also recommended. It was suggested that a night nurse be appointed at once. Further details are available in the full report. The workhouse became a Public Assistance Institution in 1930 and then became Redhills Hospital in 1948 following its absorption into the National Health Service. It closed in 1990 but in 1996 it was operating as Redhills House Day Centre for mental patients, under Exeter Community Health Trust, before its redevelopment for residential use. 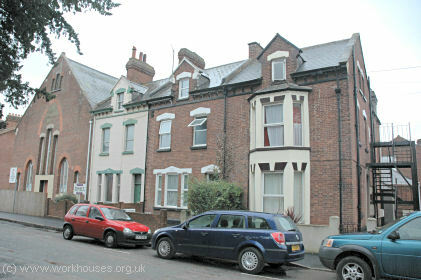 In October 1908, the union bought a house known as Chase Villa at 49-51 Church Road, Exeter. It converted the property into a home for twenty children. St Thomas Church Road children's homes, 2005. Children from the home originally attended St Thomas Girls and Infants School in Union Street, built in 1873, or the girls and infants school in Okehampton Road, which opened in 1891. The boys probably attended the boys school in Dunsford Road. In 1911, the former boys school in Cowick Street was remodelled and opened as a girls and infants school and during 1911 and 1912 only, some of the children from the home were sent to this school, many of them having previously attended the Okehampton Road school. Devon Heritage Centre, Great Moor House, Bittern Road, Sowton Exeter EX2 7NL. Holdings include: Guardians' minute books (1836-1931); Births and vaccination returns (1906-15); Various committee minutes. NB: the union minute books were well indexed at this time and the names of some of the children in the care of the union who appear in the minutes can be found in the indexes. Of the schools attended by children from the Union Street home, Devon Record Office only holds admission registers for Cowick Street (DRO ref: 76/3/2/1). The registers record each child's name, date of birth, date of admission to the school, date of last attendance and cause of leaving. Usually either the foster mother's name or the superintendent's name is given as the child's parent or guardian, but in some cases the child's mother's name is given. At this time the superintendent was Frederick Crute and the foster mother (or matron) was Mrs M. Crute.